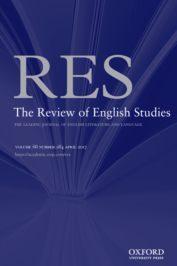 The Review of English Studies was founded in 1925 to publish literary-historical research in all areas of English literature and the English language from the earliest period to the present. From the outset, RES has welcomed scholarship and criticism arising from newly discovered sources or advancing fresh interpretation of known material. Successive editors have built on this tradition while responding to innovations in the discipline and reinforcing the journal’s role as a forum for the best new research. When an army of Kentish insurgents gathered south of London on 12 June 1381, the firebrand priest John Ball is said to have addressed them with a subversive proverb: “When Adam delved and Eve span, where was then the gentleman?” On the following day, the rebels flooded into London, orchestrating spectacles of political violence. They razed the sumptuous Savoy Palace of John of Gaunt, King Richard II’s despised uncle, and beheaded both the treasurer of England and the archbishop of Canterbury. The Great Rising of 1381 was a politically literate revolt. The rebels clamoured for social justice; they demanded dignified labour conditions and, above all, access to land and game. Their access to reading and writing reveals that they also received support from what Kathryn Kerby-Fulton calls the “clerical proletariat”. This was England’s first revolution, anticipating in its scope and ambition many of the lofty goals laid out three hundred years later in Jean-Jacques Rousseau’s milestone treatise On the Social Contract (1762). Right at the top of the rebels’ reading list was William Langland’s remarkable Middle English narrative poem The Vision of Piers Plowman . This allegorical work is made up of an intricate series of enmeshed dream visions. Will, the poem’s dreaming protagonist, undergoes emotional, spiritual, and social trials, some of which end in personal progress, others in failure. Usually rated as one of medieval England’s greatest literary achievements, Piers Plowman underwent a bewildering history of manuscript transmission. The poem circulated in three main versions, called the A, B, and C Texts. Version A is the earliest and substantially shorter than the other two, whereas B presents the text in its socially most radical form. Having seen what his poem had helped to unleash in 1381, Langland tempered its radicalism in the C Text, which, as Steven Justice has demonstrated, shows signs of self-censorship. Existing evidence suggests that the rebels knew only the A Text. Letters allegedly found on the bodies of some Kentish insurgents included paraphrases from this early version of Piers Plowman. But new evidence from Norfolk, where the rising peaked, suggests familiarity with the B Text, the uncensored long version of the poem. Only this variant of the piece includes a celebrated line in which William Langland reveals his identity: “‘I have lived in the land’, said I, ‘my name is Long Will’” (Passus 15, line 152). If the words I have italicised here are read from right to left, so the argument goes, the name “Will Langland” leaps from the page. Yet none of the annotated manuscripts that contain this line makes this clever connection. In fact, those medieval commentators who point out in the margin that this line reveals the name of the author, underline “Long Will” or bluntly declare that “the name of the author of this book is Long Will”. To contemporary readers the author was known simply as Long Will or Will Longwill – read from left to right. My archival research has led me to a number of unnoticed lawsuits pleaded in the Court of Common Pleas in 1381 on behalf of Richard Holdych, a former Norfolk sheriff and tax inspector who became one of the main regional targets of the revolt. A closer look at the records reveals that Holdych’s properties experienced a wave of violence in the immediate build-up to the rising, as part of long-term resistance that flared up into open revolt in the summer. One record of trespass from that year features a poacher called “William Longewille”. This is a rare name which only occurs in two 1385 indictments and in a record from 1450. Yet this later instance is again linked to a popular revolt: it belongs to a labourer called William Broun who used “Long Wyll” as an alias to incite an insurrection on behalf of John Cade’s rebellion. The rebels of 1381 are known to have used pseudonyms, including that of the titular character “Piers Plowman”. Even the leader of the rising, Wat Tyler, assumed the nom de guerre “Jack Straw” when he met King Richard to present the rebels’ core demand – free access to hunting. If “William Longewille” was another pseudonym used in a poaching attack, then there exists new evidence to connect the B Text of Piers Plowman to the rising in Norfolk. This new research further confirms that Piers Plowman stood for radical social action, even beyond 1381. As a political tradition, the figure of Piers the Ploughman frequently appeared in radical pamphlets of the mid-Tudor period, and Eric Weiskott has recently revealed that passages from the poem found their way into sixteenth-century political prophecies. Some time before the Great Rising of 1381, Langland lost control of the B Text of Piers Plowman which went on to acquire a rebellious life of its own. ‘The Vision and Creed of Piers Ploughman, Second & Revised Edition.’ available freely at Project Gutenberg. Public Domain via Wikimedia Commons. Sebastian Sobecki is a professor of Medieval English Literature and Culture. His research concentrates on medieval English and early Tudor literature, especially Chaucer and Gower. He is the author of "Hares, Rabbits, Pheasants: Piers Plowman and William Longewille, a Norfolk Rebel in 1381" an article published by the journal The Review of English Studies.